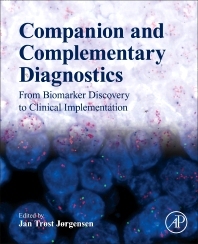 Companion and Complementary Diagnostics: From Biomarker Discovery to Clinical Implementation provides readers with in-depth insights into the individual steps in the development of companion diagnostic assays, from the early biomarker discovery phase straight through to final regulatory approval. Further, the clinical implementation of companion diagnostic testing in the clinic is also discussed. As the development of predictive or selective biomarker assays linked to specific drugs is substantially increasing, this book offers comprehensive information on this quickly-evolving area of biomedicine. It is an essential resource for those in academic institutions, hospitals and pharma, and biotech and diagnostic commercial companies. Jan Trøst Jørgensen holds a master’s degree in pharmaceutical science and a Ph.D. in clinical pharmacy from the University of Copenhagen, Denmark. He has more than 30 years of experience in research and development in pharmaceutical, biotech and diagnostic companies, such as Novartis, Novo Nordisk and Dako/Agilent. Within the past 15-20 years, his focus has been on drug-diagnostic co-development projects in oncology. Dr. Jørgensen is a strong supporter of a more individualized pharmacotherapy, and he has published a number of scientific papers on companion diagnostics, drug-diagnostic co-development as well as on stratified and personalized medicine. Furthermore, he has been quoted as inventor or co-inventor on several patents and patent applications. He also serves as referee for scientific journals and research foundations and he has given lectures at various universities as well as at national and international conferences. In the recent years, Dr. Jørgensen has also worked as editor and co-author on books and special focus editions for scientific journals and are member of several editorial boards. Dr. Jørgensen was featured in 2015 interview for Elsevier R&D Solutions, Pharm & Life Sciences about his work on precision medicine and his development of a drug-diagnostic co-development model.